Chiropractic has a wealth of methods and styles. It is always evolving and developing. It is a major treat when a new method arrives that solves health problems better and faster. From the early days of "rack and crack", through the advanced approaches of muscle testing, chiropractic continues to progress. Proprioceptive Technique has been a breakthrough of earthshaking proportions. It is an offshoot and refinement from Applied Kinesiology, the chiropractic specialty that developed muscle-testing as a diagnostic method. The new technique is delivered with the doctor's thumbs. It is very fast and painless. The best thing about it is what it does. The relief and correction of the most difficult problems is the usual. Recently a patient came to me with severe low-back pain, and pains that shot down his leg. It was difficult to stand up from sitting, and he was all crooked when standing. The tests showed he had a disc injury. In only one painless proprioceptive technique treatment, he was standing straight, with pain in leg and low-back virtually gone. Every day new patients come to me with hand, arm or shoulder problems. With proprioceptive technique, testing for what is causing the pain, numbness or weakness is speedy and accurate. This technique rapidly changes the nerve signals to normal, and enables us to replace displaced joints with complete accuracy. Damaged joints and torn ligaments respond faster to this than anything seen before. A patient with a whiplash injury was in severe neck pain and had a constant dull headache. Proprioceptive technique disclosed that her neck muscles were so weak they could barely hold her head up from the examining table. In the first treatment, that strength was completely returned, and her pain rapidly departing. This month a patient flew her dad, a professional musician, in from Arizona for a chronic knee problem that kept him from walking normally, and playing his drums. In three days, he went home, able to walk without pain and play his music. He was ecstatic that his knee was playing that bass drum without the agony he had grown used to. Yesterday a man consulted me who had taken a bad fall. His ankle was in severe pain, and he had been favoring it for over a week. The hospital had seen on x-ray that it wasn't broken, "so it must be some torn ligaments or a sprain in there." They sent him home. He was concerned that the pain was so bad, and the severe swelling hadn't gone down a bit. With only one proprioceptive technique treatment he immediately stood up on the bad ankle, discovered the pain was way down, and he was absolutely wowed. This technique enables us to test and correct virtually every area of the body: back, neck, arms, hands, knees, feet, etc. It is a definitive method for helping people with whiplashes, auto accidents or other injuries. It is every bit as useful for chronic pain that is years or decades old. It is remarkably effective on even arthritic or degenerative joints. And it is ususallyt miraculous over areas of failed surgery or replacement joints that are not working as the person would like. Our clinic is still one of the few pracices in the U. S. in which all chiropractors are thoroughly trained and drilled in all the nuances of this brilliant breakthrough technology. You have to love the impact in creating a happy, pain-free and normally moving and functioning body. And, of course, that's the kind of body you'd love to have. Proprioception is the awareness or perception of stimuli relating to position, posture, equilibrium, or internal condition. 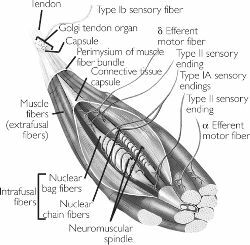 Receptors (nerve endings) that are in skeletal muscles and on tendons are providing constant information on limb position and muscle action, and this is necessary for coordination of limb movements. This awareness involves perception of gravity. In humans, gravity, position, and orientation are registered by tiny grains that are called otoliths. These grains move within two fluid-filled sacs in the inner ear in response to any change in position or orientation. The motion they describe is detected by sense hairs. Rotation is detected by the inertial lag of fluid in the semicircular canals acting on the sense hairs. The central nervous system integrates signals from the canals to allow perception of rotation in three dimensions.